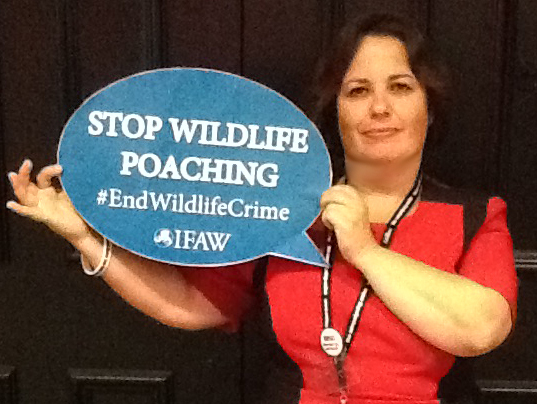 Southport Labour Party’s Candidate Liz Savage has shown her commitment to protecting animals by pledging her support for the International Fund for Animal Welfare’s (IFAW) campaign to end wildlife poaching. At the Labour Party Conference, Liz is pictured with a speech bubble to highlight the issue and send a clear message that she wants the UK to continue to take the lead in the international community to stamp out wildlife crime. The illegal wildlife trade generates an estimated £11.6 billion per year. It ranks fourth on the list of the most lucrative global illegal activities behind narcotics, counterfeiting and human trafficking. Criminals are attracted to wildlife trafficking for the huge profits and low penalties. Disturbingly, the proceeds are used to fund well-armed rebel and militia groups who are willing to slaughter threatened species and kill people to obtain elephant ivory, rhinoceros horn and other wildlife parts. IFAW’s work to combat wildlife crime includes providing training and equipment to anti-poaching ranger units, training customs officials to identify and seize wildlife contraband, collaborating with law enforcement authorities to arrest and prosecute black market traders and working to reduce demand for these products throughout the world, particularly in China.